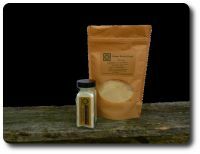 There is nothing like fresh garlic, but if that is not an option, a homemade type of garlic powder is the way to go. Whether it is from our farm or another local source, getting local garlic powder is almost like getting a bulb of garlic in a jar. We make our powder here from pure clean garlic cloves, no other additives. 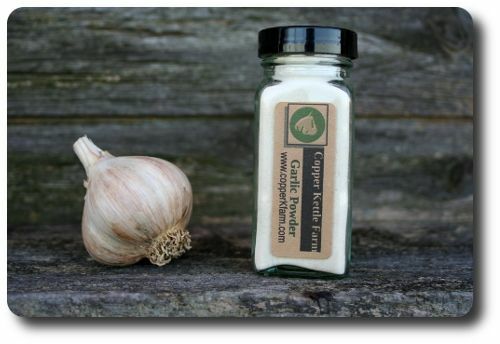 We place our garlic powder in a recycleable glass container as a classic storage vessel. This jar is 3 ounces of pure garlic powder and when it's empty you can always order the bulk powder to refill. Flavor is robust and we recommend using less than you would in a store bought garlic powder. You will taste the difference. ©2019 store.copperkfarm.com - All rights reserved.